Share this product and receive a $8.45 sharing discount. 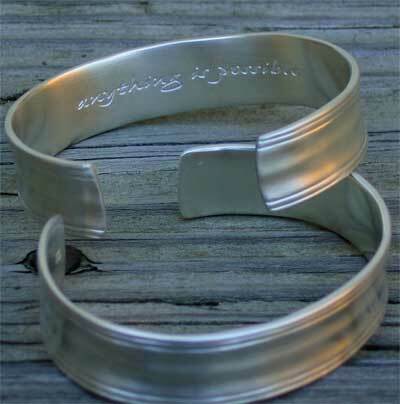 This sterling silver cuff bracelet is finely engraved with 'Anything is Possible' on the inside of the cuff. The sentiment is concealed within the bracelet, an ever present reminder, yet always secret to the wearer. Mark 9:23. This striking cuff bracelet has been created from the shape of an ancient Greek finger ring of around the 9th or 8th century BC. The varied ribbing effects and soft undulations in the metal are typical of the transitional period between the metalwork of the Mycenaean period (around 1100BC), and the beginnings of the archaic period, when Greek art began to be influenced by the eastern traditions of Persia and beyond. 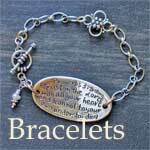 This bracelet is made of sterling silver thus slightly adjustable to fit most any wrist.